Searles Golf & Country Club01485 534211work Golf - 9 holeWelcoming, 9 Hole par 34 Course open to all on a pay and play basis. Designed in a links style with good large greens and the Heacham River winding through the 3rd and 4th hole. The par 5 eighth follows an ancient reed bed to finish with par three ninth in front of the club house, the course provides challenges for novices and the more experienced alike. A ten bay driving range is available to learn improve, or warm up prior to playing. Golf societies are more than welcome, groups can be catered for with packages including accommodation, unlimited golf, prizes and competitions, a range of day or short break packages are also available prices starting at £12.50 per person. Please contact the country club for more details and ask to speak to the course manager. PGA pro Ray Stocker is now available at for lessons at Searles, superb golf breaks complete with lessons are also available. With Junior coaching taking place every Sunday at 10am for just £3 for one hour. The Country Club is also the base for the well-stocked fishing lakes, bowls green, tennis courts and astro putting which are open to all. The Country Club has lovely views over the course, marshes and fishing lakes and serves lunches daily with a steak night every Wednesday and Saturday. Searles Leisure Resort had a wide range of accommodation available from budget caravans to luxury lodges so accommodation is available for your Norfolk golf trip. Welcoming, 9 Hole par 34 Course open to all on a pay and play basis. Designed in a links style with good large greens and the Heacham River winding through the 3rd and 4th hole. Welcoming, 9 Hole par 34 Course open to all on a pay and play basis. Designed in a links style with good large greens and the Heacham River winding through the 3rd and 4th hole. The par 5 eighth follows an ancient reed bed to finish with par three ninth in front of the club house, the course provides challenges for novices and the more experienced alike. A ten bay driving range is available to learn improve, or warm up prior to playing. Visitors are welcome at any time, on a pay and play basis, although booking is not needed, we recommend that you call to ensure that no competitions or societies are taking place when you intend to visit. Green Fees: Reduction for Members Guests and Searles Leisure Resort Guests midweek. Extra 9’s at a reduced rate. Dress code on the golf course: Golf attire - no jeans, football shirts or shorts, no tracksuit bottoms. Shirts must be collared. Golf shoes or trainers only. Golfers are required to have an understanding of the Rules and Etiquette of the game Golf societies: Golf societies are more than welcome, groups can be catered for with packages including accommodation, unlimited golf, prizes and competitions, a range of day or short break packages are also available. Please contact the Country Club for more details and ask to speak to the course manager. Golf Lessons and Breaks: PGA pro Ray Stocker is now available at for lessons at Searles, superb golf breaks complete with lessons are also available. With Junior coaching taking place every Sunday at 10am Other facilities: The Country Club is also the base for the well stocked fishing lakes, bowls green, tennis courts and astro putting which are open to all. 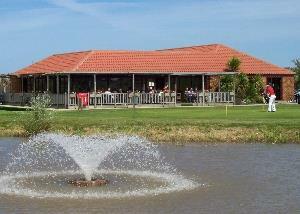 The Country Club has lovely views over the course, marshes and fishing lakes and serves lunches and evening meals daily. Searles Leisure Resort had a wide range of accommodation available from budget caravans to luxury lodges so accommodation is available for your Norfolk golf trip. Excellent road links enable an easy journey to Hunstanton from all parts of the country. Take the A149 from Kings Lynn. As you enter Hunstanton the B1161 is well signposted to the South Beach at the 1st roundabout. On reaching the 2nd roundabout carry on a further 20 meters and turn left into Searles. Follow the golf road to access the country club.